Carl Gustav Jung, Swiss psychiatrist and founder of analytical psychology, was born in Kesswil on Lake Constance, in 1875. His family moved to Laufen by the Rhine falls when he was six months old. He was the oldest child, and had one sister, Gertrud. His father, Paul Jung, was a pastor in the Swiss Reformed Church. His youth was marked by vivid dreams, intense religious questioning and extensive reading. From 1895, he studied medicine at the University of Basel, where he engaged in extensive extracurricular reading in philosophy, theology, spiritualism and psychical research, and participated in seances. After his medical studies, he took up a post as an assistant physician at Burghölzli hospital at the end of 1900. In 1902, Jung became engaged to Emma Rauschenbach, whom he married and with whom he had five children. His early experimental work on word associations established his reputation as one of the rising stars of European psychiatry, and together with Eugen Bleuler, he played an important role in establishing the modern diagnostic category of schizophrenia. Jung became a lecturer at the University of Zürich, and in 1909, gained an honorary degree from Clark University. In 1906, he commenced a collaboration with Freud and played a critical role in launching the international psychoanalytic movement – organising its first congress, editing its first journal, and becoming the first president of its international association. In 1909, he left the Burghölzli, to devote himself to his burgeoning private practice and independent research. In 1914, he withdrew from the psychoanalytic movement, and resigned from the University of Zürich. By the outbreak of the First World War, Jung had played a critical role in the institutional development of psychoanalysis and made critical interlinked contributions to the development of psychical research, dynamic psychiatry, psychological testing, psychotherapy, cultural psychology, and the psychology of personality. However, it was from that time onwards that his most distinctive work took shape. In 1913, Jung had a series of apocalyptic visions. 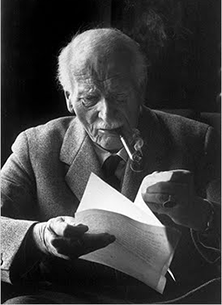 Struck by the correspondence between these and the subsequent onset of the war, Jung engaged in a process of self-experimentation which he termed his ‘confrontation with the unconscious.’ At the heart of this project was Jung’s attempt to get to know his own ‘myth’ as a solution to the mythless predicament of secular modernity. This took the form of provoking an extended series of waking fantasies in himself. He later called this the method of ‘active imagination.’ Jung elaborated, illustrated and commented on these fantasies in a work which he called The Red Book, which was at the centre of his later work. In his practice at this time, Jung encouraged his patients to undertake similar forms of self-investigation. His adoption of nonverbal techniques in psychotherapy was to play an important role in the rise of art therapies. Jung maintained that his fantasies and those of his patients stemmed from the mythopoetic imagination which was missing in the present rational age. Reconnecting with this could form the basis for cultural renewal. The task of moderns was one of establishing a dialogue with the contents of the collective unconscious and integrating them into consciousness. This was to play an important part in a popular ‘mythic revival.’ He maintained that cultural renewal could only come about through self-regeneration of the individual. He termed this the ‘individuation process’, which was an account of the higher development of the personality. Consequently, for Jung, psychotherapy was no longer a process solely preoccupied with the treatment of psychopathology. It became a practice to enable the higher development of the individual through fostering the individuation process. This became the focus of Jung’s later work. In his scholarly writings, he undertook a comparative historical study of the individuation process in various cultures and epochs. Conceived as the normative pattern of human development, it was to form the basis of a general scientific psychology. From the 1920s onwards, Jung embarked upon the psychology of religion, taking his cue from the psychology of religions movement, and in particular, from the work of William James and Théodore Flournoy. He attempted to develop a comparative psychology of the religious-making process. Rather than proclaiming a new prophetic revelation, his interest lay in the psychology of religious experiences. The task was one of studying the translation and transposition of the numinous experience of individuals into symbols, and eventually into the dogmas and creeds of organised religions, and finally, to study the psychological function of such symbols. Jung maintained that such a psychology of religion could in turn revivify Christianity, through explicating the living meaning of its symbolism and practices. Jung engaged in the comparative study of, among others, Buddhist, Hindu and Taoist practices of personality development. His studies of Eastern thought played an important role in mediating and introducing Eastern esoteric practices and conceptions to the West, and bringing the work of contemporary Indologists and Sinologists to a wider audience. He devoted particular attention to the study of medieval alchemy. In the 19th century, figures such as Mary Atwood and Ethan Allen Hitchcock had argued that the chemical language and images of alchemy were simply an exoteric device covering the esoteric moral and spiritual purposes of alchemy. From around 1912 onwards, Théodore Flournoy and Herbert Silberer developed this into a psychological interpretation of alchemy. From the 1930s, Jung embarked on an extensive study of alchemy. His understanding of it was based on two main theses: first, that in meditating on the texts and materials in their laboratories, the alchemists were actually practising a form of active imagination. Second, that the symbolism in the alchemical texts corresponded to that of the individuation process which Jung and his patients had been engaged with. He maintained that the alchemical tradition had functioned as historical compensation for the one-sidedness of Christianity, and its study could provide what was lacking in the later. As well as providing a psychological study of religious and cultural history, Jung’s alchemical works functioned as an allegorical presentation of his own work. Rather than write directly of his experiences and those of his patients, he commented on analogous developments in esoteric practises. From the 1920s onwards, a large international movement grew around Jung, and Jungian psychotherapy trainings began to be formalised in the 1940s, and spread throughout the world. Jung’s readership was widespread and extensive, particularly in the English-speaking world, and his works played an important part in the rise of the new age and alternate religions movement. He died in 1961, leaving a vast corpus of manuscripts and correspondences which is only partially published.